tips ​and video lessons you can do at home! 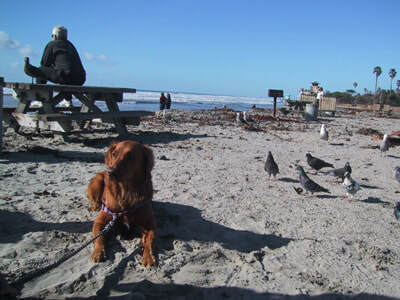 ​Some prospective surf dogs jump right on the board, the first time in the ocean!! You'll see some dogs surfing the first time out, but there are other dogs who jump off, and use the surfboard as a diving board! Others are too distracted to focus on surfing, or others who just aren't sure about this new activity. These tips can help those that might be having a hard time getting started, or who don't have much time to spend at the beach. Most of these exercises can be done in the comfort of your own home! They've been prepared as a training template by our Executive Director, Judy Fridono, a dog trainer. But you don't have to do each and every step if your dog doesn't need it. We've just identified some of the problems that can arise, and have given you tips to fix them! These tips will take you to the point of surfing in the waves. Because we are dog trainers, and believe in foundation training for pretty much anything dog related, we started Surf Dog Ricochet's training when she was just a wee pup... but, you can start at any age! Our philosophy of training is relationship based, meaning two way communication! Relationship based training creates a very solid human-canine bond, and you'll have fun exploring your dog's mind when you listen to what he/she has to say! If you saw Surf Dog Ricochet's inspirational SURFice dog® video, you already know that we believe in letting dogs choose their path in life. Rather than trying to mold dogs into human expectations, we believe in allowing them to be who they truly are, even if it's something completely opposite of the original goals. Surf Dog Ricochet still like to chase birds, and we give her plenty of opportunities to do so, but she can control her impulses too. So, if you're just having a problem with distractibility, these tips can help. But, if your dog really doesn't want to surf, don't make them. The main thing with relationship based training is... you'll be improving your human-canine bond while building confidence, and having fun sharing an activity both in and out of the water, or wherever your dog may lead you! The tips only take a few minutes a day, and most can be performed in the comfort of your own home! Are new to dog surfing, and want to build a foundation before hitting the waves. 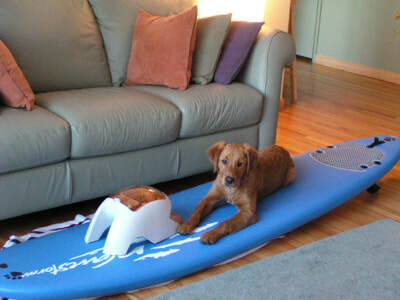 Want to do some surf dog training at home, especially in the winter! Have encountered "issues" such as jumping off the board, or distractibility. Want to foster a stronger human/canine bond that easily transfers to the water. Have limited time, and can't get to the beach regularly. Want to add surfing to their training repertoire! Ready? Let's get started. There are videos that go with each lesson, and appear as links under the title. You can read the tips and watch the videos in whatever order you want, but they do go in succession. But, the most important lesson is... HAVE FUN WITH YOUR DOG!! "What type of surfboard to use, and introducing your dog to the board"
The best surfboard for surf dogs is a foam board, so we can grip it. Costco sells Wavestorms for $99, or you can find a used foam board, like an INT on Craigslist. Smaller dogs usually get 6 foot boards, and larger dogs go for 8 footers. If you don't have a surfboard, but still want to work on these training tips, you can use other things, such as a towel, a piece of plywood, a boogie board, a rug, a beach mat... or anything that would be representative of being "on" something. Plywood would probably work the best as you can have it cut to the approximate size of a surfboard. You would want to add carpet to it though so the dog could grip it. You can also contact surfboard companies, surf schools, etc to see if they have broken boards. It wouldn't work in the water, but could be perfect for practicing at home. One very important note... don't force your dog on the board. You want them to offer the behavior, and learn to jump on by themselves. This is especially helpful for big dogs that can be very heavy to lift once you get in the ocean. Plus, if a dog is refusing to get on the board... maybe they really don't want to surf. Bring your surfboard in the house, and feed your dog their meals on it. This makes a positive association with the board. You want your dog at the back of the board, so be sure to place his/her food bowl right in front of where you want them to be. This will reinforce the correct position for the dog. Dogs love belly rubs, and a surfboard is a great place to give them! Again, you're making a positive association with the board. Doing this also helps build the human-canine bond even more! Don't leave the surfboard out when you're not training. You want your dog to get excited when he/she sees the board. "Teaching your dog to offer behaviors on the board"
Some dogs can jump on a board in the ocean and surf the first time they try. Others use the surf board as a diving board, and jump off when the board starts to move. Others are a little freaked out by the movement of the board, and it takes them a little longer to get the hang of it. Still others are just used to going to the beach to play ball, and aren't quite sure what this new game is all about, or what to make of dogs surfing. When using treats, always treat the dog ON the board. You want to reinforce the behavior of the dog being ON the board, not getting off the board. Never force your dog onto the board, and pick him/her up to place on the board. You want your dog to make the decision to get on the board by themselves. Training is a good way to bond with your dog, as it increases the communication between the two of you... creating a solid relationship! You can lure your dog onto the board at first, but quickly fade it. You don't want him/her depending on the treat to get on the board. You can have them do a hand touch where you put your hand palm out where you want the dog to be on the board. Dogs are curious by nature, and will touch your hand with their nose to see what's up. As they do, you can say "touch". Treat them on the board, and then walk away. They will most likely follow you. Walk back toward the board to see if they'll get on. If not, hold your hand out again, and say "touch". Give treats while he/she is on the board. Your dog will quickly get the idea that being on the board is how they get treats, and you can fade out the hand touch. When they step onto the board you can say "yes", "good" or use a clicker to mark the behavior of getting on the board. Your dog will also quickly understand that good things happen on the board because they've been getting fed their meals on it. It won't take them long to know where to be! Some dogs surf standing up, some lay down, and others sit. It's all personal preference of your dog! "Teaching your dog to "stay" on the board"
Once your dog is eager to get on the board, you can start introducing a "stay" or "wait" cue. You want your dog to stay on the board even if you aren't near. Because once you push your dog off into a wave, he/she's on their own. You want them to stay on the board, not jump off and swim back to you. When your dog is doing well with the "stay" or "wait"... begin taking steps backwards so you put distance between yourself and the dog. Walk back to the dog to treat on the board. When your dog is comfortable and stays on the board when you step back a couple feet, build upon that until you're able to walk completely around the board. At first you may only get a few steps, but as you progress you'll be able to run around the board while your dog stays on it! Use a word to release your dog from being on the board, such as "release". You want the dog to learn they should stay on the board until you give the release cue. Using the release cue will let them know it's ok to get off the board. Many dogs surf backwards because they're watching their owner/handlers who pushed them off. If you want your dog to surf forward, be sure to work on the "stay" or "wait" while you're behind the dog. The key is for him/her to continue facing forward even though you're behind them. That said, some contests give more points for a dog who surfs backwards. So, you don't have to do the exercise above! I find it better to be able to surf both ways... impress those judges with your maneuvers! What about the ball, the other dogs, the birds? Now that you've got a great "stay" or "wait", start introducing distractions. There are a ton of distractions at the beach, and you don't want your dog to jump off the board to go after a ball, another dog, or dig in the sand! Start out slowly. Have your dog in a "stay or wait", and just show them a ball. No movement... very low key. At first you may only be able to do this for a few seconds. The reward for staying is getting released to get the ball. So, say "release", and let the dog get the ball. As your dog progresses, toss the ball in the air, catching it in your hands. Again, the reward is releasing them to play with the ball. Once your dog is doing well with you throwing the ball in the air, you can begin bouncing it on the ground. At first, start out with him/her staying for just a few seconds, and release to play. Build upon those seconds until your dog can stay for minutes! Go slow with these exercises as well. You want your dog to be successful, and these exercises can be hard for a ball motivated dog! Next, you can start rolling the ball on the ground, but just a short distance. Don't progress through each step until your dog is successful with the previous step. It may take weeks to work on distractions... don't get discouraged! You will always be working with distractions, so practice often. You can build up the distractions to include movement around the board by kids, running, other dogs roaming around, you playing with another dog, etc. You want to give big praise for the dog staying, and a big game of ball as a reward! "Getting your dog used to the movement on a surfboard"
Now that your dog is excitedly getting on the board, positioning themselves in the right spot, staying in position no matter where you are, or what distractions there are... you can start making the board unsteady... trying to simulate how it'll be in the ocean. You can use pillows or cushions under the board to make it un-even where the dog has to balance. Some dogs may be apprehensive to the movement at first, so go very slowly with the exercises, especially if your dog hasn't had experience on un-even or un-steady surfaces. Start out with having your dog step onto the board as you hold it secure by putting your foot on top of it to stabilize. Give your dog treats as they're stepping onto the board, as this will re-direct their attention to the treats, and away from thinking about the movement of the board. If your dog is nervous... just do it once to start out with, and build upon that. As you continue working with your dog his/her confidence will increase. Don't overwhelm your dog by going to fast with the exercises. Go slow. You are building your bond, and you don't want a bad experience to harm it. If your dog has one bad experience (in his/her mind), he/she may never get on the board again. Help your dog be successful... lots of treats and praise can help! When you are releasing your dog from the un-steady board, put your foot on it again to stabilize it. After he/she builds more confidence you won't have to do it anymore, but at the beginning don't take any chances of your dog getting scared. Once your dog is more comfortable getting onto an un-stable board, you can begin moving the board very slightly as you give him/her treats and praise. This is helping the dog build confidence on the board, and their bond with you will deepen as they feed off your confidence! If you have enough people, you can lift the board while the dog is on it. But, first start by lifting only a couple inches off the ground, and then slowly increase as your dog builds confidence. Go slow with these exercises, and before you know it you'll be able to rock the board more, and your dog will be confident on it. When you reach that level of confidence, you can put bigger pillows under the board to make it more un-stable. When you do, treats and praise again. "Getting your dog used to a life jacket"
Now would be a good time to get your dog used to a life jacket. Safety is very important when surfing, and a life jacket should always be worn. If your dog has never worn one, putting it on the first time might feel funny. So, practice putting the life jacket on. Have plenty of treats to make it a positive association. First without your surfboard. 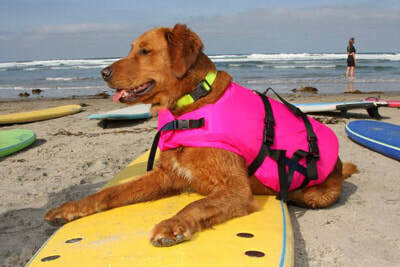 Once your dog is comfortable with the lifejacket, you can have her/him get on the board wearing the life jacket. When you first introduce the jacket to your dog, let him/her sniff it. Don't put it on yet... just acquaint your dog with it while giving treats. Make it a positive association. As your dog is comfortable, you can drape the jacket over his/her body, giving treats as you do. Don't buckle it yet. If your dog doesn't seem bothered by the jacket, buckle the front as you give him/her treats. Then move on to the buckles on the body part of the jacket. By giving treats as you do this, you're re-directing their attention, and creating a positive association with the jacket. Some dogs may be afraid of the life jacket, or it may feel funny on their body if they've never worn anything against their coat. So, you want to build their confidence, and giving treats will re-direct their attention. To continue getting the dog used to the jacket you can put it on, and then feed their meals while they're wearing it. Once your dog is comfortable wearing the life jacket, start feeding him on the board with it on. You want him/her to get used to being on the surfboard with a life jacket. Wiping out is part of dog surfing... just like human surfing! Life jackets come in very handy to pull your dog back onto the board. 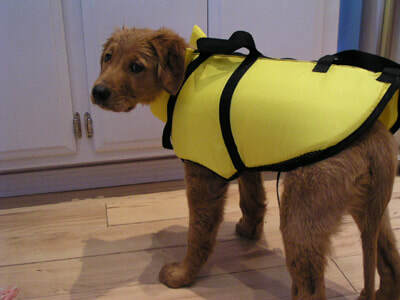 You can purchase a doggie life jacket at pet stores, boat stores, or online. The main thing you want is a good fit for your dog. Because you may be lifting your dog onto the board after a wipe out, having good support under their belly is important. "Building confidence in the water"
When all is great on dry land, you can move it to a swimming pool. Now, the picture has changed for the dog, so you should go back a few steps so the dog gets comfortable in the new environment. Make sure your dog wears a life jacket... even in a pool. Remember, you don't want to force your dog on the board, let him/her make the decision to get on. You can start in a kiddie pool with a puppy or small dog. Larger dogs you can start in a regular pool. Hold the board steady when the dog initially gets on. You can begin by luring the dog on the first couple times if necessary. Stop luring after the first couple times, and use praise and treats as a reward to reinforce the behavior of getting on the board. 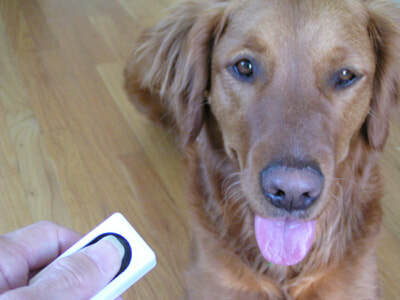 You can also use "touch" to help the dog understand what he/she should do. If they fall off the board, make it positive too. Give treats, have fun, praise in a happy voice... make it a happy experience. Once the dog is ready, you can begin pushing the board around the pool while you hold on to the board. Lightly rock the board, and give your dogs treats and praise to help build his/her confidence. Go slow with this because it's new to your dog, and you want him/her to be successful. From there, you can push the dog off, so the board goes from one end of the pool to the other. At the beginning, you may want to have a helper in the water to catch the board as it reaches the other side. They can also reinforce your dog with treats and praise. 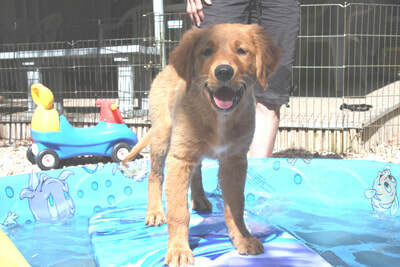 When your dog is comfortable in the pool, you can begin introducing distractions so he/she learns how to be on the board in water while other things are going on around him/her. Don't do all the exercises at once. Let your dog get used to one step before you progress to the next. Help your dog be successful... your bond will continue to deepen! "Taking what you learned to a bay, lagoon, lake, etc"
After graduating from the pool, you should go to a calm water lake or bay. Here in San Diego, Fiesta Island is a great place to start because you have small waves from the watercraft, and your dog can ride his first wave, and be SUCCESSFUL!! You want your dog to succeed so he/she doesn't get discouraged. And a lot of praise. This is exciting! There will be many distractions once you get to the beach, so really reinforce here! Lots of praise, treats, release to play ball. Put the board in shallow water at first, and give your dog lots of praise for staying on the board in this new environment. Begin pushing the board in the water so your dog can experience what it's like to be in a large body of water on a surfboard! Hold onto your dog, and let them know they're safe with you. The bond you've been building with all this training really comes into play now. Your dog trusts that you'll keep him/her safe, and it's your job to ensure his/her safety! Once your dog is comfortable with you pushing him/her in the water, take him/her out just a little ways, and push into a small wave. Let them ride their first wave!! Yipppeeee!! Now you're ready for a surf dog competition! Good luck. Oh, and dog forget surf dog names... many surf dogs have surFUR names. Like Ricochet's is Rip Curl Ricki. 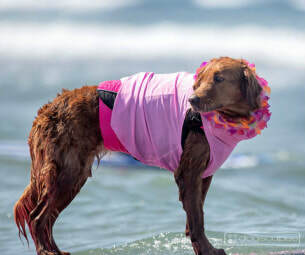 Some of the dog surfing competitions that are available are Surf City Surf Dog, Helen Woodward Surf Dog Surf-a-thon, Surf Dog Events contest in Imperial Beach and the World Dog Surfing Championship in Pacifica. 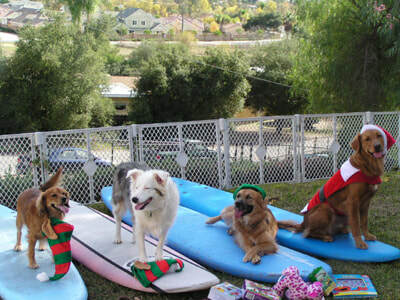 Many of them also offer surf dog lessons and surf dog clinics prior to the event. Believe it or not, there are many different surfing animals these days. Don't be surprised if you end up competing with cats, pigs, goats, alpaca's and others. You'll find a bunch of dog surfing videos on YouTube, so be sure to check them out. "Teaching your dog the correct position on the board using a clicker"
If you clicker train, you can use the board like you do "go to mat". With a puppy, you can click for hand touches as they step onto the board. I was trained to get into the correct position through free shaping. Always listen to your dog. If they don't really want to surf, try something else. If they like it, but only want to ride a couple waves, that's ok. Don't force them to ride more. It's all about improving your human-canine bond, and having fun! These tips took you all the way to still water, but there's one more step left!! And that's getting in the waves of the ocean and surfing!! And don't forget to sign up for your first surf dog competition. ​Paw-abunga!! Make sure to wear a life jacket!